On Thursday the Swami Vivekananda delivered a lecture at the Town Hall, Maidenhead, taking as his subject "The Eastern Doctrine of Love. "* Owing to other attractions in the town the attendance was not large. 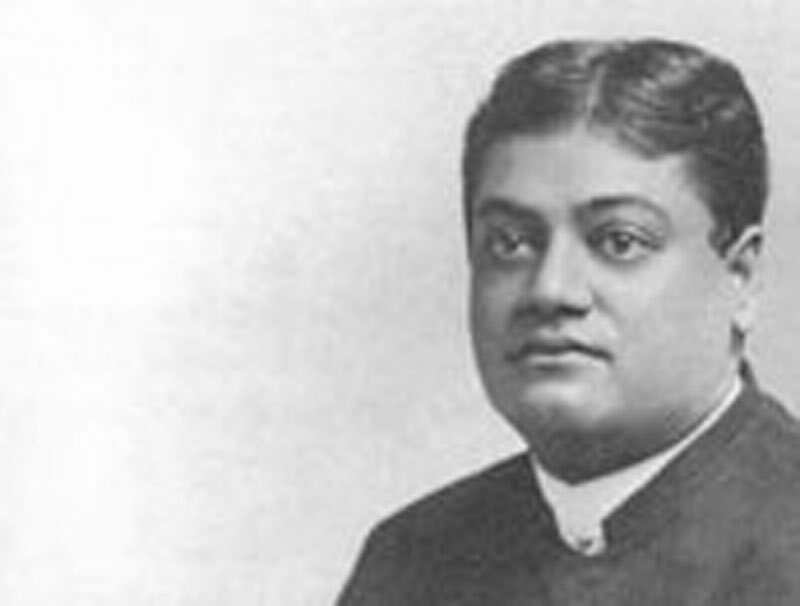 Many of the public also associated the lecturer with the Theosophical Society, with which, however, he has, we are informed, nothing whatever to do, nor with any other society, neither does he propose forming any society himself. He believes in expounding his views to whoever will listen to them and leaving those individuals to advocate them as a whole, or with whatever modifications they may deem fitting, or to reject them altogether, believing that out of the strife of all opinions truth at length prevails. The chair was taken at 8 p.m. by Mr. E. Gardner, J.P., C.C., and he very briefly introduced the lecturer, who was clad in his native costume. The Swami then proceeded to express his view upon devotion to deity, or, as more commonly expressed in the East — love (Bhakti), to the following effect: — Religion may be divided into two forms, the first almost entirely superstitious and the second merely metaphysical, but if either of these is to have any force it must be accompanied by love. Work alone without this element did not satisfy. The land might be covered with hospitals, penetrated by good roads; there might be great social institutions well conducted, and good sanitation, but these were all external physical processes and by themselves brought man no nearer to Divinity. Both the realist and the idealist were necessary and complementary one of the other. The idealist brought the bold aspiration down to earth, the realist caused it to take form through work. Love cannot be defined in positive terms, only negatively. Its nature is of the form of renunciation. In its more general sense it might be divided threefold: (1) That love which is for one's own pleasure, irrespective of pleasure or pain to others — the purely selfish, the lowest. (2) That love which exchanges — "I will love you if you love me. We will make each other mutually happy" — the partially selfish, the middle path trodden by the great majority of mankind. (3) That love which gives all and asks for nothing, without premeditation and which never regrets, unconquerable by any evil thing done to him from whom it emanates. It is the highest, the divine. Only with this last kind are we concerned here. The first is the path of the sensualist and the animal, the second the path of struggling humanity on its way to better things, the third the real path of love, trodden by those who renounce the world and set out upon that road which leads to Eternal Peace. In that love there is no fear. Love kills fear. A lion might stand over a babe and threaten its life; the mother knows no fear, she does not fly, but she opposes. At that moment love destroys terror; at other times the same woman would run from a small dog. A fierce Mahomedan [sic] warrior went to a garden to pray. In the same garden a girl had appointed to meet her lover. The warrior lay prostrate on his face according to the prescribed form of his religion. At that moment the girl espied her lover, and with joy rushing to meet him, trod upon the prostrate form. He jumped up and laying hand upon his sword would have slain the girl. "How dare you?" cried he, "vile wench, disturb my worship, my devotion to God, with your base feet." "Worship! devotion!" cried the girl, "you do not know what they are. You had no devotion, lying there, no spirit of worship. If I, a timid girl, could so forget the presence of an object of dread like you, in my worship and devotion to my earthly lover as to tread upon you and not even know it, how much more should you, if your heart had been absorbed in love and devotion to God, have been ignorant that I touched you?" The warrior was humbled and appeased and went away. Our highest ideal of love is the image which we form for ourselves of deity. A barbarous people have a tyrannical and cruel god. A wise and noble people see God in ever and ever widening potencies. God is always God, but the views which men and nations may take of Him vary. No higher view is known than that of love. The man who bears in his heart an unrelaxing love to every creature, whether he recognise that that creature is a manifestation of God, in which he is actually present, or whether he look upon it merely as fashioned by Deity, that man is on the path to Deity, on the great path of devotion and renunciation. He cannot injure the creature of God, however repulsive to his narrower view of what should or should not be. He gives in love, not in pride; in loving Deity he loves its manifestations, works with them and abides by them. The lecture was impressively delivered, and at the close a vote of thanks was accorded the Chairman (on the proposition of Mr. E. T. Sturdy, of Caversham). The proceedings occupied only a little over half an hour.